You are currently browsing the blog archives for June, 2006. Mr. Wittman doesn’t understand the fact that elephants have long memories. It won’t soon be forgotten. Rest assured that Republicans will remind voters this fall which political party voted to say that it’s ok for media outlets to expose legal, important counter-terrorism programs and which took the fight against Islamofascists seriously. The larger point is that journalists have taken up the task of holding this administration accountable. That isn’t the point at all. The NY Times said that there wasn’t a question of legality with the program. They merely said that it’s a matter of public interest, which is utter nonsense. It’s a matter of national security. Ms. Clift’s disinterest in national security is further proof that progressives don’t think of national security as a high priority. Instead, Ms. Clift thinks it’s just something that Republicans talk about to put Democrats on the defensive right before elections. Further, Ms. Clift’s claim isn’t serious. It’s merely meant to distract from the issue of the vote that she describes as pure theater. She knows, or at least should know, that national security is an important issue. She should know that covert counterterrorism programs should remain just that- covert. This is just another example of the ancient Agenda Media circling the wagons after one of their own is justifiably attacked for reckless reporting. Hat’s Off To Lynbrook Collision Center!!! A month ago, I posted something about hitting a deer & crumpling up my Jimmy. Thanks to the good work of the people at Lynbrook Collision Center in Waite Park, that damage is now history. My main contact was with Nick. Unfortunately, I didn’t get Nick’s last name. My apologies to Nick for being that forgetful. At any rate, Nick did the inspection & estimate, then ordered the parts & scheduled the repair. Everything was done professionally & promptly. The deer that hit my car was killed instantly the moment it struck the passenger front headlight. That crumpled the front quarter panel, which Lynbrook replaced & repainted, along with doing a great job on the factory pinstriping. Lynbrook also replaced my entire front headlight assembly & the grill. In addition to replacing those parts, they also repaired the hood & the body side moulding on the front passenger’s door. And they detailed the car, too!!! You can’t beat that with a big stick. What was most impressive to me, amongst a long list of impressive things, was the rapidity with which they completed the repairs. I brought my Jimmy in Wednesday afternoon at 3 PM & I had it back Friday afternoon at 2:30. Granted, my vehicle didn’t require any intricate work like frame-straightening or realigning the 4WD, etc. Still, getting it back that fast & done with that quality was impressive to me. Needless to say, I’ll recommend Lynbrook to anyone who asks. The repairs they did were done at a high professional level & they were done quickly & at a pretty reasonable price. You can’t do better than that. I welcome Ms. Pelosi to the Irey Campaign Team, and hereby deputize her as a Colonel in the Irey Army, because in releasing that statement, she rebukes Jack Murtha for his reckless condemnation of U.S. Marines at Haditha and his unilateral decision to deprive them of THEIR rights of due process. Jack Murtha declared on May 17 that our Marines had Ã¢â‚¬Ëœkilled innocent civilians in cold bloodÃ¢â‚¬â„¢, before the first Marine was charged, before the first court-martial was convened, before the first soldier was convicted. When he did that, he deprived our own soldiers of the very rights to due process that Nancy Pelosi extols. In the spirit of bipartisanship, I’d like to congratulate Ms. Pelosi for her putting a higher priority on the rule of law than on partisanship. That’s what Larry Sabato and David Wasserman think will determine who controls the House after this November’s elections. Here’s what they think the 4 t’s are: Terrain, Top-of-the-Ticket Influences, Treasuries of Campaigns and Traits of Candidates. In February, we rated only 11 races as “toss-ups,” and only 8 of those races were in Republican-held seats. Additionally, as we have rotated some districts in to the Dirty Thirty and others out, we now estimate that Democrats will only need to win 22 of the 30 most competitive races to win control of the House, down from 24 in February and 26 in October, still a tall mountain to climb, but more surmountable than ever. How any political analyst could say with a straight face that “Democrats will only need to win 22 of the 30 most competitive races to win control of the House” is beyond me. The rule of thumb is that, whether it’s a wave election or not, the best a party can expect to do is win 50 percent of the vulnerable seats. For instance, when Republicans regained control of the House in 1994, they gained 52 seats. At the time, Republican strategist Joe Gaylord rated Democrats as having 100 vulnerable seats. It’s worth noting that a portion of those 30 “most competitive seats” are Democratic seats. But because Democrats have succeeded in putting the Republicans on the defensive this year, there are now more than three times as many GOP-held seats as there are Democratic-held seats in the Dirty Thirty! The count stands at 23 vulnerable seats for Republicans and only 7 for Democrats. The symbolic measure, which passed 227-183, was inspired by a June 23 New York Times report detailing a CIA terrorist-tracking program that studies banking records. I’ll bet that Democrats didn’t like being put on the record that they don’t condemn officials leaking top secret counterterrorist programs to the press, especially when the reporting itself says that laws weren’t broken and abuses weren’t reported. If that’s what Mssrs. Sabato and Wasserman characterize as Democrats having the GOP on the defensive, then they need new glasses and a transfusion of common sense. In summation, I don’t know how this passes as serious political analysis. It’s riddled with inaccuracies and omissions. How they could omit talking about the GOP’s time-tested GOTV operation is a telltale sign to me that these guys didn’t do their homework. The provisions of the Geneva Convention were intended to protect noncombatants, including prisoners, in times of armed conflict. But as the administration has repeatedly noted, most of these protections apply only to conflicts between states. This section essentially says that people only qualify for Geneva Convention protections if they’re wearing a uniform that has “a fixed distinctive sign recognizable at a distance.” They don’t have to be part of a nation’s military but they have to be visibly identifiable as being combatants in a conflict. Clearly, Hamdan wasn’t wearing a “a fixed distinctive sign recognizable at a distance.” In fact, I’d bet the ranch that nobody being held at Gitmo was wearing anything that’d fit these requirements. Furthermore, Fred Barnes said that he’d talked with someone from the Reagan administration yesterday afternoon about terrorists being covered. This Reagan administration official said that the subject came up in the eighties and that it was summarily rejected. The implication of this is monumental: the four liberal idiots, joined by Justice Kennedy, ratified unilaterally a new ‘treaty’ that gives terrorists rights that the Geneva Convention says that they aren’t entitled to having. In that light, it’s impossible to figure out how the Bush administration could be war criminals when SCOTUS wrote new law yesterday. In closing, it’s clear that Ms. Brooks either needs (a) to be more thorough in researching the Geneva Convention so she knows what she’s talking about or (b) to stop selectively choosing which Geneva Convention rules she’ll apply to terrorists. In short, she’d be wise to tell the whole truth, not just the convenient truth. Georgia voters must present government-issued photo identification to cast a ballot in the primary election, which is less than three weeks away, the State Election Board said Thursday. The U.S. Department of Justice cleared the law Wednesday, and the elections board decided to require IDs for the July 18 primary despite concerns about whether there was time to educate voters. The board’s lone Democrat blasted the decision to move forward without an education outreach targeting those who lack a photo ID issued by the Georgia Department of Drivers Services. “It’s a shame and it’s an embarrassment to this state,” David Worley said. Mr. Worley, it isn’t a shame or embarrassment to require a valid ID to vote. It’s a shame and an embarrassment to let voter fraud go unchecked. Democrats are using this legislation to rally support in the African American community. In the end, it won’t matter because more people are on the GOP’s side on this. Republican leaders in Congress said yesterday that they will draft legislation to grant the Bush administration the authority to try prisoners at GuantÃƒÂ¡namo Bay before a military tribunal, a move that sets up a contentious debate between Republicans and Democrats on a hot-potato national-security issue just four months before midterm elections. “Following the July Fourth recess, I will introduce legislation, in consultation with the administration and my colleagues, that authorizes military commissions and appropriate due-process procedures for trials of terrorist combatants,” Senate Majority Leader Bill Frist said yesterday after the court’s decision. It seems to me that this decision should trigger a no-brainer solution: Congress should pass a law that grants the President the proper authority. That’s precisely what Bill Frist and Lindsey Graham intend to do. Furthermore, I’d laugh at Sen. Leahy’s statement that “This arrogance and incompetence have delayed and weakened the handling of the war on terror…” Ask Zarqawi if “this arrogance” has weakened the handling of the GWOT. That is, if they can raise him at their next seance. If Democrats want to fight Frist’s and Graham’s legislation, then expect them to lose more seats this November. That’s a fight they can’t win. I wandered down to the U of MÃ¢â‚¬â„¢s Humphrey Institute today to document the wisdom Amy Klobuchar had on “A Minnesota Vision for Ethics Reform in Washington”. The Former Vice President Walter Mondale was in attendance. 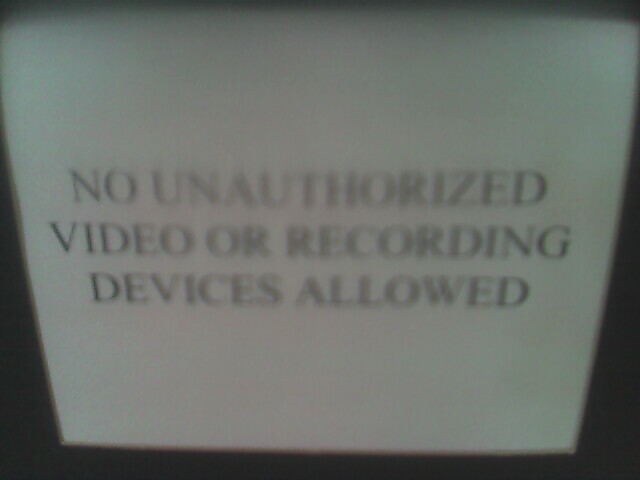 I was not allowed to video tape, record, or take a single still picture at the event. I went up and asked the person at the sign in table if I could get my devices authorized, and the Klobuchar staffer who was there said no. “Where was Mark Kennedy when his own House leadership was making a mockery of ethics and accountability in Congress?” said Karl Frisch, spokesman for the Democratic Senate Campaign Committee. Karl, maybe he was looking into the DSCC’s unauthorized accessing of Michael Steele’s credit history by using ‘unusual means’ to get Mr. Steele’s social security number. The DSCC’s employees are last people who should be talking about ethics and accountability. Furthermore, I’d remind people to what I said earlier about lobbyists: It isn’t whether you accept campaign contributions; it’s a matter of whether those campaign contributions affect your vote. Thus far, I’ve seen no evidence that these contributions have had even a minimal effect on Mark Kennedy’s voting habits. That self-serving statement is intellectually dishonest. If due process is “among our most cherished liberties,” then where was Ms. Pelosi when John Murtha was playing judge, jury & executioner before the invevstigation was even completed? Has Ms. Pelosi backed up her commitment to this “cherished” liberty by demanding John Murtha retract all his judgmental statements and issuing a formal apology? I watch a ton of news articles each day and I don’t recall her demanding that. Whenever I read a Pelosi statement like that, I get an urge that I’ve never acted on, namely to slap her senseful. I wouldn’t say that I’d beat her senseless because it’s obvious that someone’s beaten me to that long ago. House Republican leaders are expected to introduce a resolution today condemning The New York Times for publishing a story last week that exposed government monitoring of banking records. The resolution is expected to condemn the leak and publication of classified documents, said one Republican aide with knowledge of the impending legislation. This is an easy decision on the GOP’s part. Not only do they condemn the NY Times’ revealing an effective counterterrorism program but they put the Democrats in the position of either voting against the NY Times’ reporting or of saying that the leaking, and reporting, of this and similar types of programs is ok with them. That’s hardly the position they want to be in. Expect Democrats to whine about the GOP ‘playing politics with national security and First Amendment issues.’ That’s a surefire sign that they’re caught betwixt and between on a thorny issue for them. Don’t be fooled by their caterwauling. It’s just their attempt to distract from expressing their opinion on the issue of leaking vital national security programs.